Maple pumpkin bars… it’s a recipe made in heaven… or at least in my kitchen- where in the colder months Pumpkin is king and Maple reigns alongside. These yummy bars set the mood for crisp, fresh, wintery weather. 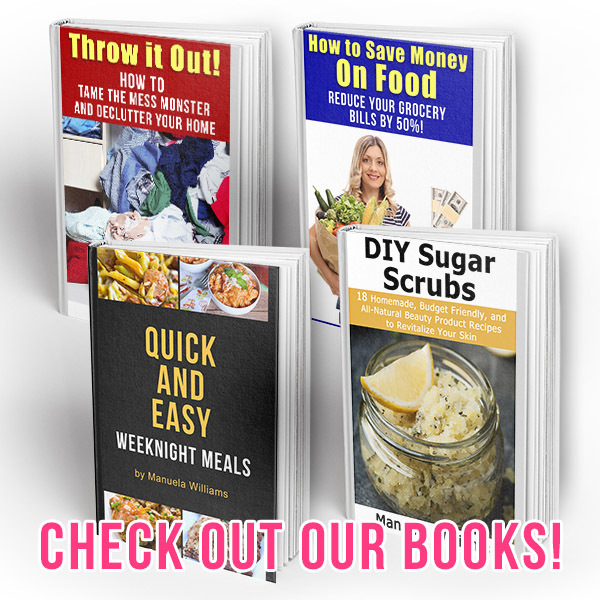 Add a little or a lot of chocolate to the mix and you have yourself the perfect dessert, breakfast, or mid-afternoon pick-me-up with a cup of coffee. These are moist, full of flavor, and with a richness that will leave nothing but crumbs on the plate when you serve them. 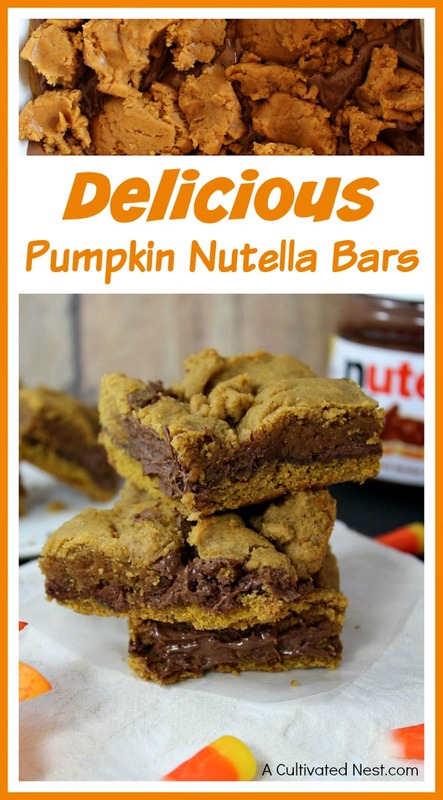 I love to make these with some walnuts added in! The crunchy texture just makes them even more delicious! If you’re allergic to walnuts, you could try pecans instead. Or you could omit the nuts altogether. 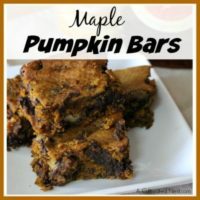 Either way, these maple pumpkin bars make delicious after-school treats or after-dinner desserts! 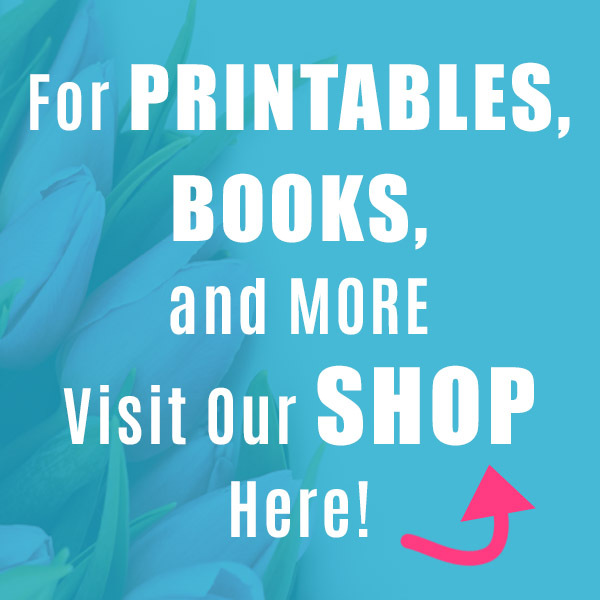 You could even package these up in nice gift bags as lovely food gifts for your friends! 2. Butter or spray a 9″ x 13” pan. 3. In the bowl of a stand mixer combine butter, maple syrup, brown sugar, egg, pumpkin puree, and vanilla. 4. Mix on medium until well combined. 5. 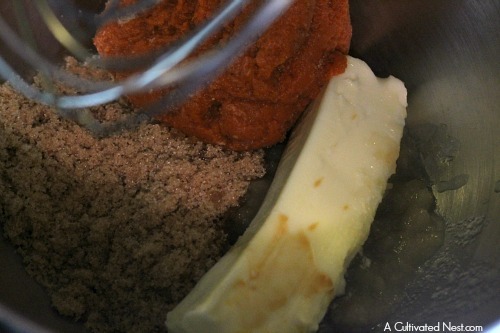 In a separate bowl mix flour, pumpkin pie spice, baking soda, salt, and cinnamon. 6. 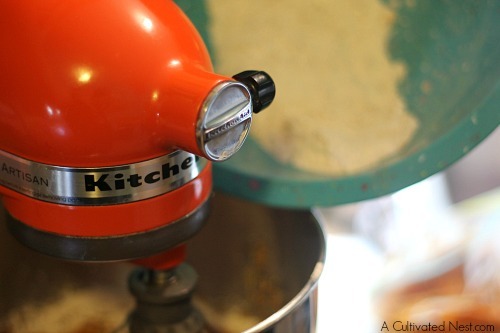 Incorporate flour mixture into wet ingredients just until combined, do not overmix. 7. 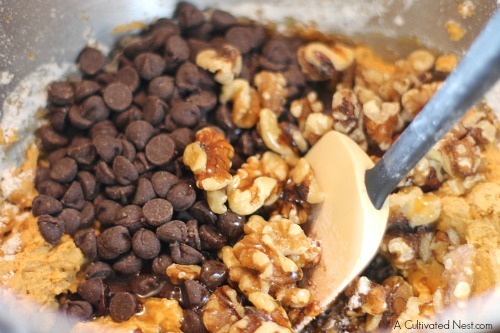 Fold in chocolate chips by hand. Add in walnuts or pecans if you’d like some added crunch. 8. 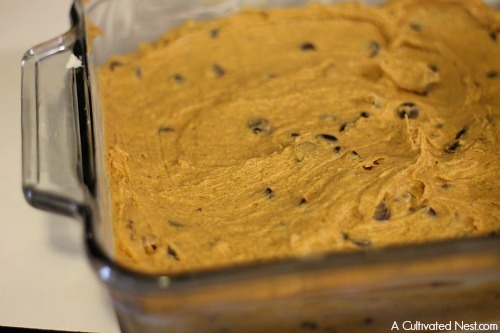 Pour batter into prepared pan, smooth with a spatula. 9. Bake for 35-40 minutes. Test the doneness of the center by inserting a toothpick- if it comes out clean they are done. 10. Remove from oven and cool before slicing into 2” x 2” squares. 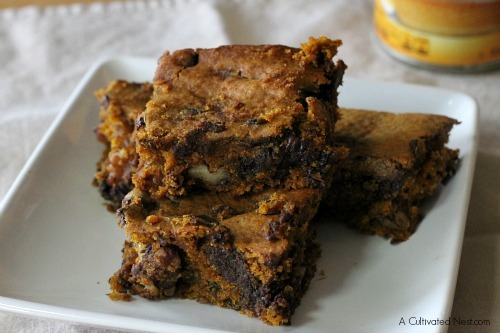 These yummy maple pumpkin bars are loaded with flavor! Butter or spray a 9″ x 13” pan. In the bowl of a stand mixer combine butter, maple syrup, brown sugar, egg, pumpkin puree, and vanilla. Mix on medium until well combined. In a separate bowl mix flour, pumpkin pie spice, baking soda, salt, and cinnamon. 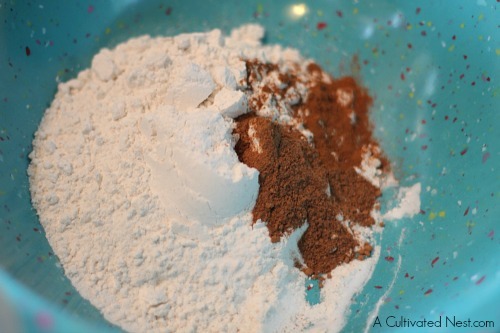 Incorporate flour mixture into wet ingredients just until combined, do not overmix. Fold in chocolate chips by hand. Add in walnuts or pecans if you’d like some added crunch. Pour batter into prepared pan, smooth with a spatula. Bake for 35-40 minutes. Test the doneness of center by inserting a toothpick- if it comes out clean they are done. Remove from oven and cool before slicing into 2” x 2” squares.